Cognitive domains have tremendous impact on the ways missionaries have to learn from the local people how to teach the Word of God. A culture hears, analyses, and learns with its culture’s current cognitive domains. The problem comes when the way God views reality is drastically different from the people’s view that we are trying to teach. Sometimes, we have to “build new file folders of reality” for our students before they will be able to understand the Kingdom of God. Of course, Satan is a master at stealing cognitive domains. If he can remove from our minds entire file folders of reality, he can hide truth very easily. It makes you wonder how many of my own file folders might be missing! 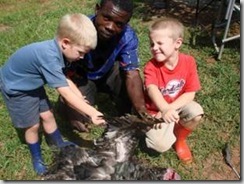 Pictured: Noah and Bryson hunting “not-so-dangerous” poultry with Axon.